Are you looking for a well-crafted scope that can handle daily abuse? 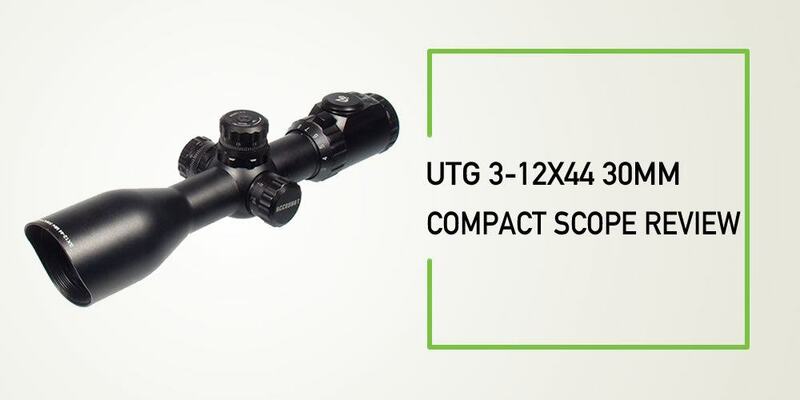 The UTG 3-12X44 30mm Compact Scope is an extremely durable scope that can withstand harsh weather conditions. The scope is perfect for hunters because it features the latest technology and other innovative aspects that make hunting fun. You can use the scope for a wide range of shooting like tactical hunting, hunting big game and predator hunting. The scope has a powerful magnification of 3x-12x, a large objective lens of 44mm and a field of view at 100 yards. Let us have a detailed look at other innovative features included in this scope that making hunting convenient and simple. One of the most important things you should check when you are buying a scope is the ability to transmit light. If a scope is designed with better lenses, then you can be sure of more light transmission. This is why the UTG scope is designed with quality emerald coated optics together with a wide field of view that allows effective light transmission. The scope is designed with multicoated lenses which are colored and feature angled sunshades. The sunshades work well in reducing the glare to give you a better vision. The scope has illumination enhancing reticle with 36 colors. This makes it perfect for all your environmental needs. Additionally, the sunshades have a top quality flip-open lens caps. Everyone wants to spend their money on a high-quality product that will last for many years. The UTG scope is designed with high-quality optics that can handle harsh weather conditions. It is shock, rain and fog proof which gives you maximum reliability when using it on your firearm. The scope also allows you to enjoy shooting throughout the day even when there are changes in temperature. Additionally, the scope is 100 percent nitrogen filled and completely sealed. 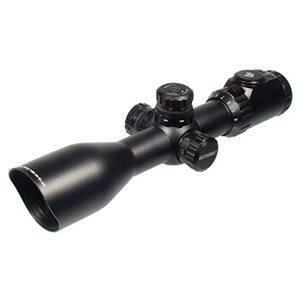 The scope features a side turret for effective parallax adjustment up to 10 yards. It is also advisable to attach an 80 or 100 mm AO wheel to the turret for effective tuning of parallax focus. This gives shooter accuracy they require at any given range. The lockable and adjustable turrets provide consistency and precision to maintain the right zero. The best scope should also provide a good eye relief. This model provides an eye relief of 84-72 mm which gives you the best view of the surrounding area. This makes the scope ideal for tactical applications. This scope has a unique circuit and a housing that ensure you get continuous illumination. Even when there is a high recoil, you can still get uninterrupted illumination. The last thing you want to own is a scope that is difficult to use. The UTG scope is one of the most affordable scopes in the market today with excellent features and a user-friendly design. It gives users with a perfect precision for long range shooting. Q: Does the scope require a battery to get crosshair? A: The crosshair of the scope is black so it doesn't require a battery to illuminate it..
Q: What is the eye relief of this scope? A: The scope has an eye relief of 84mm-72mm. Q: Is this cope waterproof and fog proof? A: The scope is fog proof and waterproof but it is not submersible. Scopes are important devices that can be used in different applications like birding, hunting surveillance, landscape viewing and much more. If you are looking for the right scope to mount on your AR platform or AK variants, the UTG 30mm scope will be great. The scope is also great for hunters who have Marauder .25 rifles. Considering its price, ease of use and other innovative features included in this scope, you have all the reasons to get this scope on your rifle. It is durable, accurate and provides a powerful magnification which makes it versatile.